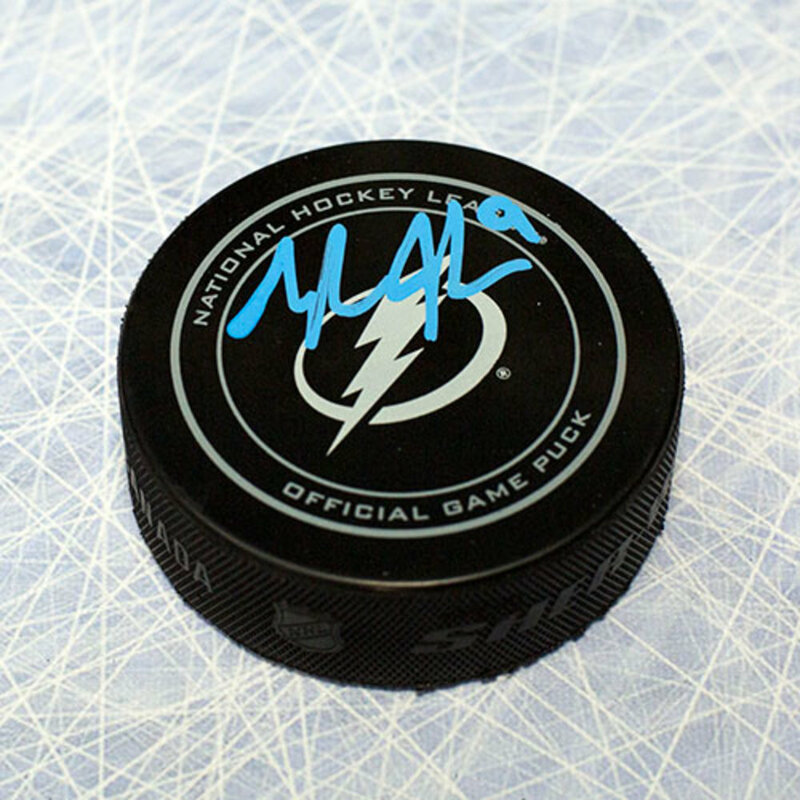 This Tampa Bay Lightning Hockey Puck has been hand signed by Tyler Johnson. A.J. Sports World guarantees this autograph with a Certificate of Authenticity and tamper resistant hologram from A.J. Sports World. International shipping rates are based on location. Please contact us for rates. We will always combine the shipping to save our customers money. All items are sent with insurance and tracking. For every $100 of the total order, $1.00 of insurance will be added to the order. All damaged or not received items will be investigated and a new item will be issued (if available) upon resolution with the carrier. We use Canada Post, FedEx, and UPS to ship all items. The carrier is determined by the size of the item(s) and the final destination. The carrier will send the delivery and tracking information to the billing e-mail provided in your customer profile. Auction wins will ship within 1 week of receiving your payment. When combining orders the shipping may be delayed in order to use one package for multiple items. We will always send you an e-mail confirming when the items are shipped. Seller is not responsible for service transit time or Customs delays at international borders. Transit times are provided by the carrier, exclude weekends and holidays, and may vary with package origin and destination, particularly during peak periods. For auction orders that are won from the same vendor within a 24 hour period, combined shipping may be applied. Please note, it is at the discretion of the respective vendor or team. If any discount on shipping is applied it will be reflected as a refund on your credit card. Please contact our customer service with your Order #’s so we can expedite your request. For items being shipped to the USA or Internationally, no taxes will be charged. Winners are responsible for tariffs, taxes, duties and any other additional costs associated with shipping outside of Canada. Please note that sales tax amount does not reflect on the bid price. You will not receive notification before the charge. The sales tax is applied once the winning bid is accepted and your method of payment is charged. All products ship within 3-5 business days upon receipt of payment. Please Note: All auctions are conducted in U.S Funds. Canadian Bidders: The winning bid will be converted from US funds to Canadian funds prior to processing payment. This conversion rate is determined on the day of which payment is processed by your affiliated credit card provider. International Bidders: The winning bid will be converted from US funds to the currency associated with your credit card prior to processing payment. This conversion rate is determined on the day of which payment is processed by your affiliated credit card provider. For product questions please email NHLAuctions@fanatics.com. Please include the listing # which is found at the top of this page. All inquiries will be answered within 24 business hours. Your satisfaction is very important to us and we look forward to assisting you. NHL.com is the official web site of the National Hockey League. NHL, the NHL Shield, the word mark and image of the Stanley Cup, Center Ice name and logo, NHL Conference logos and NHL Winter Classic name are registered trademarks and Vintage Hockey word mark and logo, Live Every Shift, Hot Off the Ice, The Game Lives Where You Do, NHL Power Play, NHL Winter Classic logo, NHL Heritage Classic name and logo, NHL Stadium Series name and logo, NHL All-Star Game logo, NHL Face-Off name and logo, NHL GameCenter, NHL GameCenter LIVE, NHL Network name and logo, NHL Mobile name and logo, NHL Radio, NHL Awards name and logo, NHL Draft name and logo, Hockey Fights Cancer, Because It's The Cup, The Biggest Assist Happens Off The Ice, NHL Green name and logo, NHL All-Access Vancouver name and logo, NHL Auctions, NHL Ice Time, Ice Time Any Time, Ice Tracker, NHL Vault, Hockey Is For Everyone, and Questions Will Become Answers are trademarks of the National Hockey League. All NHL logos and marks and NHL team logos and marks depicted herein are the property of the NHL and the respective teams and may not be reproduced without the prior written consent of NHL Enterprises, L.P. © NHL 2016. All Rights Reserved. All NHL team jerseys customized with NHL players' names and numbers are officially licensed by the NHL and the NHLPA. The Zamboni word mark and configuration of the Zamboni ice resurfacing machine are registered trademarks of Frank J. Zamboni & Co., Inc. © Frank J. Zamboni & Co., Inc. 2016. All Rights Reserved. Text Bidding has been added to NHL auction in order for you to bid wherever and whenever you'd like directly from your phone. This new feature allows you to place bids, receive bidding notifications, and confirmation notifications directly by text. In order to use this new feature please remember to opt-in within the Text Bidding section of your account to the terms and conditions as well as have your credit card on file. Click here to login and register your phone number for Text bidding. If already registered, text ;<bidAmount> (e.g., ;20) to +19049901334 to bid.